1 Shaped like umbrellas, jellyfish are free-spirited swimmers. Sometimes they swim by contracting their soft bodies to push them forward, but other times they just drift to wherever the water currents take them. 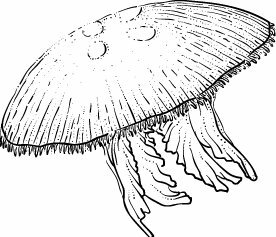 While nearly all jellyfish live in the ocean, a number of them take up residence in freshwater lakes. 3 There are more than 200 different species of jellyfish in the world. They come in a variety of sizes and colors. Lion's mane jellyfish are the largest species of jellyfish. Their bells (jellyfish's round, umbrella-like bodies) can reach 8 feet across, and their tentacles can be more than 200 feet long! Most jellyfish have see-through bells in all sorts of colors. Some even glow in the dark!